Jordan Whitehead (#9) has impressed the coaching staff with his playmaking ability. Jordan Whitehead might be inexperienced. He might not completely know the playbook. Sometimes, he might not even be in the right place. But whatever mistakes the young defensive back makes early in his career, they’ll be easy to swallow after considering his raw skill and athleticism. The freshman safety from Central Valley High School in Monaca, Pennsylvania, made that abundantly clear to cornerbacks coach Renaldo Hill throughout training camp. Defensive coordinator Josh Conklin has plenty to work with when it comes to Whitehead’s athleticism and playmaking ability. That innate ability assisted Whitehead to the tune of seven interceptions on the defensive side of the ball his senior season of high school, while also carrying it over on offense for 35 total touchdowns and 1,933 rushing yards. Whitehead understands, though, that this isn’t high school, and he can’t simply hang his head high on his accomplishments at Central Valley. Besides game speed, Whitehead has to acclimate himself to a more complex playbook and more talented, diverse offenses. To succeed at in the ACC, Whitehead will have to learn from other former high school standouts, like corner Lafayette Pitts, safety Reggie Mitchell and wide receiver Tyler Boyd. Pitts, Whitehead said, has helped him and the other defensive backs prepare mentally, while Mitchell is always eager to answer Whitehead’s questions. Boyd has been key in showing him how to conduct himself on the football field. Whitehead has kept his eyes and ears open to his teammates and coaches and has made it a point to do the same in the film room. Through those film studies, coaches acknowledged that Whitehead’s production sticks out, regardless of his relative unfamiliarity with the schemes. 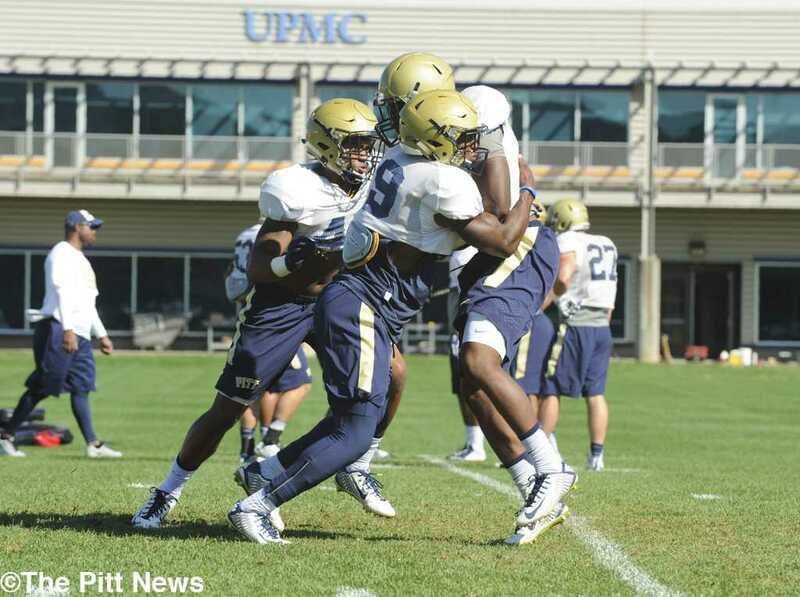 Whitehead can be “felt” most in his playmaking, which was a struggle for the Pitt defense last season. The unit ranked 84th in interceptions and 117th in fumble recoveries, but Hill said Whitehead has the potential to alleviate some of those woes. “As a whole unit, we have to answer those questions [regarding playmaking]. He’s going to be a huge part of that,” Hill said. Whitehead relishes the opportunity to contribute in a big moment. “If you make a play, you’ll be known for something,” Whitehead said. That playmaking ability could stretch beyond defense. In the recruiting process, Pitt head coach Pat Narduzzi talked to Whitehead about having the chance to play in some packages on offense, split wide or out of the backfield. Those dreaming of Pitt’s own version of Deion Sanders shouldn’t get so excited so soon, though. Offense will be on the backburner until Whitehead is more comfortable defensively. Still, Whitehead might have a chance to dazzle on special teams, as he was one of the main players fielding kick returns throughout training camp. “I’ll miss [offense] a little bit, but punt return, kick return, I’ll get a chance to make something happen,” Whitehead said. As the season starts up, the coaches will continue to evaluate Whitehead to determine his playing time. At the beginning of camp, junior Jevonte Pitts and sophomore Pat Amara sat in front of him at strong safety, though he’s made enough strides for Pitt to list him as a co-starter with Amara for week one. As Whitehead’s elders, Pitts and Amara have a firmer grasp on the playbook. Playbook knowledge, though, will always fall secondary to playmaking for the Pitt staff. “At the end of the day, production is always going to be the No. 1 key factor,” Conklin said.